If so, please know that I am with you! That sounds like a dream come true. But instead of dreaming about it, I am taking action to get our homeschool space well-organized. After reading books about decluttering, minimalism and organization, I’ve realized that the desire to have a well-organized space is not a trivial one. There are actually significant benefits to having less stuff and an organized home (and homeschool). But things got messy and a bit disorganized……..
A more recent photo of our messy, disorganized school room. 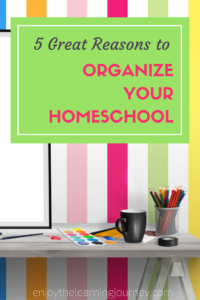 It can be difficult to find the time and energy to organize and then sustain an organized homeschool space. With lessons and activities and meals and cleaning, it doesn’t always feel very doable to squeeze in time to improve the organization of our home and homeschool. We kind of slide by and do the best we can but as time continues on and we accumulate more materials, things become more disorganized. It takes a lot of time to get things in order. Or so we think. But whether you’ve been homeschooling for a while and need to get some organization back in place or you are just starting and need to get things in order, there are some really great reasons to take the time to declutter and organize your space. Did you know that clutter makes you feel mentally and physically fatigued? It causes stress and anxiety. I personally have experienced severe anxiety over a cluttered, messy home so I know it is real! But when you have an uncluttered, organized space you will feel more calm, more peace, more lighthearted and those are all great things that will also lead to more joy in your home and homeschool. This is the completely practical side to having an organized space. When things are in order and each item has a designated home that space becomes more functional. You’ll be optimizing your space and you’ll be able to find things easier. Even if you don’t have everything in perfect order, just getting some organization in place can make a big difference in the amount of usable space you have. If you are tired of moving your piles of homeschool books and papers around to make room (raising hand) then this is a great reason to organize your homeschool! With a more functional space you’ll be able to use your time more efficiently and be more productive in a way that is meaningful to you and your family. Productivity doesn’t have to mean that you or your children are cranking out a ton of work, because that’s not the point, but it does mean using your time well to get tasks accomplished. I know it’s hard for me to concentrate and be productive in a messy, unorganized area and I’m sure it is for my kids too. It’s hard to see the big picture when you are surrounded in a mess. With a clear space comes clarity so that you can stay focused on what matters most to you. With a less-cluttered space your thoughts will be less cluttered, your thinking more clear and you’ll be able to make better decisions. When you get side-tracked by a temper-tantruming toddler, you may just be able to handle the situation more easily. It’s important for our children to build good habits as they grow up. 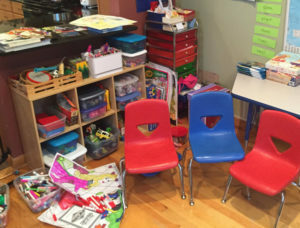 Keeping an organized space means that your kids can learn that every item has a place and and that when they get something out or make a mess they need to clean up. We are setting them up for success when we give them a good orderly clean space to begin with. Well, I’m convinced. How about you? 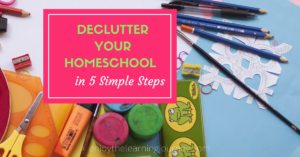 If so, go to the next post in the series ~ Declutter Your Homeschool in 5 Simple Steps. 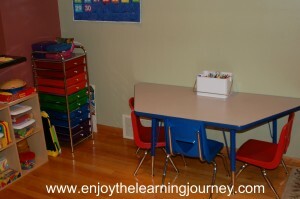 You can organize your homeschool quickly and efficiently! If you missed the first post in the series, you can read it here. Such a great reminder! Especially about organization helping with efficiency. This is true for me and the kids as well! They spend too much time looking for a sharpened pencil or lined paper!